Apply for the RBC® Rewards™ Visa‡ Platinum card and get 15,000 points towards your next adventure. Points can be spent on everything from flights and accommodation, to activities and experiences. Use our credit card pre-qualification tool to start your credit card application process and find out if you pre-qualify for a credit card today! Hurry! Offer ends May 31, 2019. This promotion is applicable to new accounts approved by May 31st, 2019 only. 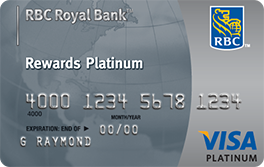 New accounts will receive the following points allocation during the promotion period: (i) 4,000 RBC Rewards points for the first purchase made during the promotion period; (ii) 500 additional RBC Rewards points when at least one cardholder on the account registers online at rbcrewardscaribbean.com; (iii) an additional 500 RBC Rewards Points when at least one registered cardholder on the account opts to receive e-marketing offers. ; an additional 10,000 RBC Rewards Points if at least one cardholder meets $3,000 USD or local equivalent in spend over 3 months from date of approval. Visit rbc.com/ecvisaplatinum and rbcrewardscaribbean.com for more details.